Former Georgian President and former Odesa Regional Governor Mikheil Saakashvili met with residents of Odesa in the evening on Thursday, January 18. According to an Interfax-Ukraine reporter, the meeting was initially to be held at Black Sea Hotel, the administration canceled it several hours before the meeting, referring to difficult weather conditions. One of the organizers told people who gathered at the hotel that the meeting had been moved to another venue - Gagarin Plaza Hotel. As a result, the meeting started at around 19.00. From 100 to 200 political supporters of the politician gathered in the hall. Saakashvili started with the presentation of a film about Ukraine with his participation. 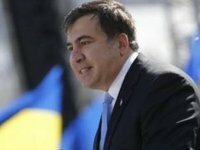 After demonstrating several episodes, Saakashvili began a speech in which he traditionally accused the current authorities of corruption, destruction of the state, etc. About 40 minutes after the meeting began, the light went off in the hall. However, electricity supply was restored a few minutes later. A teammate of the politician said that electricity had been turned off at the request of the Ukrainian Security Service (SBU).